DEGY Dance are thrilled to be taking bookings for our new sizzling hot dance party on the roster, Salsa Fiesta! This highly engaging event brings the fiery moves and sounds of a Latin dance party straight to your event and is now available to start booking for dates in August 2019. 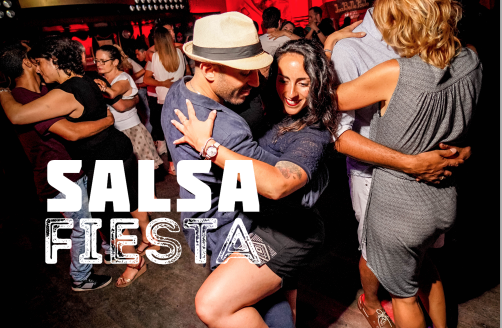 Joining alongside our other successful dance parties, Salsa Fiesta is yet another in-demand and fully immersive cultural dance event that everyone can enjoy! Dancing is long proven to be one of the best ways to be active and Latin music is arguable one of the most exciting and infectious sounds in music. Most recently, Latin tunes have taken the US pop charts by storm! It’s clear Latin music is here to stay so why not learn the dance moves that go to your favorite, new Latin and Spanish tracks. On top of that, salsa dancing is one of the most popular styles of dance in the world making your new found skill something you can put to use in nearly every city cross the US and beyond. Our professional Latin dance duo arrives at your event to warm up and get the venue ready for lessons, demos, and dance party. Guests will be greeted as they arrive, then our dancers will begin teaching a 60 minute group dance lesson showing your guests the basics steps in three of the most popular styles of Latin club partner dancing. Salsa, Bachata, and the Merengue. After your group lessons finish up, our duo will perform a thrilling dance demo to get everyone fired up to get the party started. It’s time to party! For the next 3 hours, the DJ will spin a mix of the hottest salsa, Bachata, merengue, reggaeton, and american pop hit-remixes where guests can put their new dance moves to work or just let the Latin rhythm take over. Our professional dancers will mingle and join your students to dance with guests all throughout the night because at Salsa Fiesta, everyone is familia! Salsa Fiesta is an interactive, educational, and cultural experience that brings people together. Dance a little or dance a lot, either way, it’s a dynamic event that everyone can enjoy. This dance party is one where you can tie in specialty foods and snacks that fit the culture and build a great event theme for your students.